Most chicken pot pie recipes call for canned cream soup, not this one. 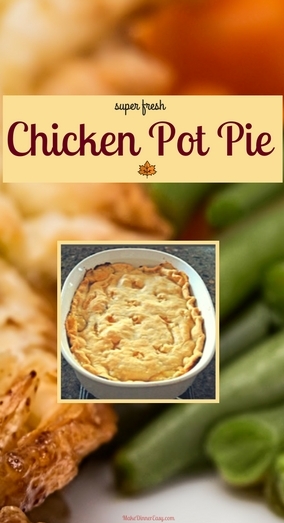 This chicken pot pie recipe calls for chicken broth and milk to make the sauce, that allows you to control the salt and fat content. 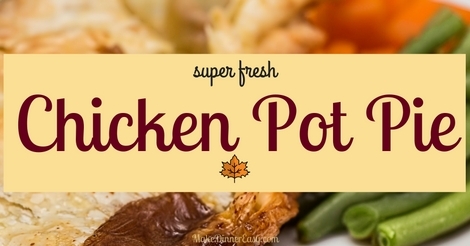 To make the preparation easier I recommended buying a pre-cooked rotisserie chicken, but you could always use leftover chicken or cook your own. 1. Melt butter in a large stock pot. Add diced potatoes, onions, celery and carrots. Sauté 8-10 minutes. Remove from heat and stir in flour very well. 2. Return to medium heat and add broth and milk. Stirring constantly until mixture has thickened. 3. Add bouillon, seasonings and chicken. 4. Pour mixture into a 2 quart casserole dish. Top with pie crust or cut star shapes out of pie crust and place on top of chicken mixture. If whole crust is placed on top, cut several ½ inch slits in the crust to allow steam to escape and crimp edges of crust. Serves 4-6. This can be doubled and placed in a 10x15x2” baking pan. This can also be made ahead or made ahead and frozen without the crust on top. Add the crust, just prior to baking.